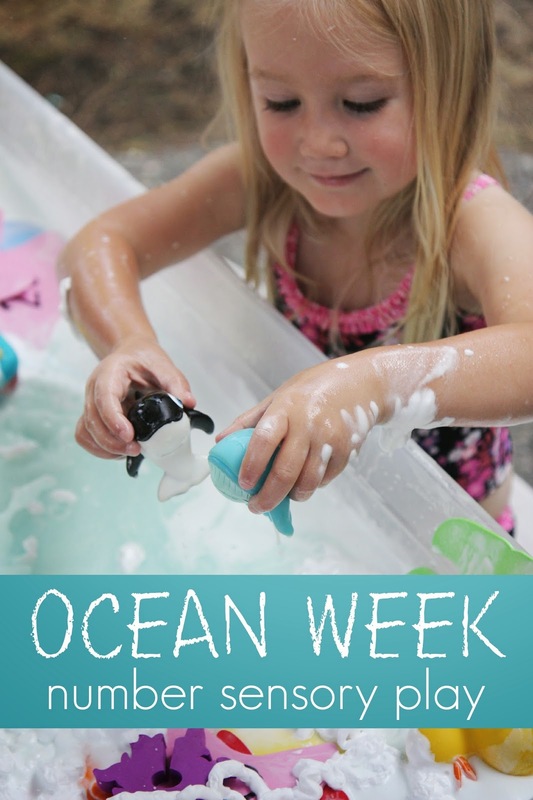 This week we are hosting Ocean Week! Each summer I like to choose themes and create our own "Camp Mom" during the weeks when we don't have trips or camps scheduled. Yesterday we shared a super easy and fun tape resist clown fish craft (and giveaway from Trunki). Today we are sharing an ocean themed sensory activity we did while also practicing some number recognition. We started off by writing number's we've been learning on our foam ocean shapes. Next we created some blue/green foam using food coloring and shaving cream and a large ziploc bag. The kids had fun mixing the colors to create a sea green colored foam. Next we added some water to our large plastic tub and then we added our foam shapes to the water and we added a little bit of our sea foam to the water too. The kids started mixing the water and sea foam together immediately and had the best time exploring the foam ocean animal shapes and other ocean animal toys we put in the water. They also talked about the numbers while they explored. Later on big kids hunted for numbers that I called out or that they wanted to find while my littlest one just search for ocean animals and practiced saying their names. Please note that by using food coloring you may get some color transfer on clothes or hands. We didn't get very much, but my hands did get a little green. My two oldest kids had a great time working together to put the numbers in order from 10-100. My oldest son (6) would tell my daughter (3.5) which number to find and then he'd take it from her and use it to put the numbers in order (skip counting by 10 from 10-100). It was really cute to see them working together. They also just enjoyed playing with our ocean animals, acting out scenarios, and also just mixing and splashing in the water. Shaving cream play is always a lot of fun, especially when water is involved. I often get asked about younger kids playing with shaving cream and whether or not it is safe. As with all activities I share on my site, each parent/educator needs to decide for themselves what they feel comfortable doing and what they don't want to do. I feel completely comfortable letting my toddler play with water and shaving cream because I am sitting right next to him the entire time giving him my complete attention. I also know that he won't put the shaving cream in his mouth because he is moving out of that stage. If your child still regularly puts things in his mouth, you may want to save this activity for when he is out of that stage. All toddlers are different so while I would never have done this activity with my daughter (who only recently stopped putting everything in her mouth around age 3), my son (age 20 months) doesn't seem to have an issue with trying to eat sensory items (other than when we are painting with do-a-dot makers). If you aren't sure if your child is ready for this sort of sensory activity yet, try it! You'll know pretty quickly :) Your child might actually surprise you and be so engaged with their other senses that they won't even think to make the activity an oral one. If you are worried about skin sensitivities, make sure you use shaving cream for sensitive skin. Others who have felt that the smell of shaving cream bothered them have also used children's foam soap instead. That could also be fun! I have heard many many arguments against the use of shaving cream in activities for children and I loved this post, called the Infamous "Shaving Cream" article, disputing many of the typical reasons people say they won't use shaving cream with kids. Check it out. It has a lot of great information if you feel like reading it. Do you have any other favorite ocean themed activities you can share with us? Head on over to our Ocean Week landing page to see the other activities we've shared this week. 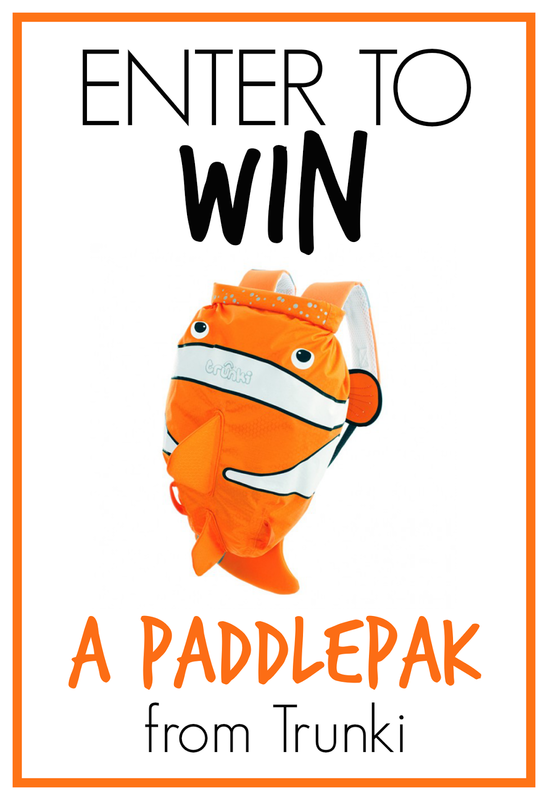 Don't forget to head over and enter to win a PaddlePak backpack for your little explorer!! There are nine different paddlepaks to choose from and all of them go along perfectly with our ocean week theme! !